Have you just graduated and are ready to embark on your first entertainment job? Or have you been working in unsatisfying career for 10 years and want to purse your creative dream? Regardless of your experience level, breaking into the entertainment business is tough. It is designed to separate those who want it to those who really want it. Entry into world of film requires tenacity, skill, knowledge and yes luck. How do you obtain an entertainment job? Ask any industry professional and they will tell you that knowledge is important. However, inside knowledge is essential. Media outlets are constantly bombarding us with box office numbers and casting decisions. That information is good but if you can understand how that information applies to the strategy of filmmaking then the information becomes essential. Only a narrow percentage of people understand how to interpret and utilize information to gain momentum. Join that elite group. To begin, define the kind of entertainment job you want. What is your passion? Do you dream of accepting the Academy Award for best director or screenwriter? Maybe you see yourself designing movie sets or creating special effects? Or is the idea of negotiating a multi-platform distribution deal for content exciting to you? Regardless of your aspirations for an entertainment job, the first step to success is knowledge: an informed creative is a successful creative. To impress potential employers or investors, know your area of interest better than anyone else. Invest in your education. FirstFilmJob offers a thorough and complete workshop – full of valuable “inside information”. The workshop outlines the business of Hollywood: hierarchy of the power players for above and below the line (and how to approach them), box office breakdown, coverage analysis, detailed explanation of the studio and independent process, and much more. 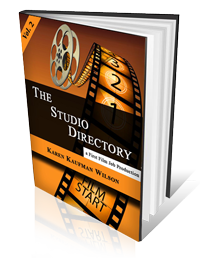 First Film Job will help you define a specific plan to either obtain an entry level entertainment job or strategize to move your career or project forward. This workshop’s industry-tested strategies are designed to help you reach your long-term career goal. Stay ahead of your competition with FirstFilmJob. Because in the entertainment business, it’s what the insiders know that counts.